the only cubs game we were going to go to was this last saturday. sad for us. So I only went to the restroom 3 times which is pretty much standard for me at a cubs game BUT one of the times, I got to cut the line with one of the seat people. I was walking out to the restroom and she asked me if I was going to the restroom. I told her that I was going there and she told me to follow her and cut the line for me. Go me and my big pregnant belly. Also, I had only one person look at me like I was crazy and actually talked to me. She asked me how I was holding up and told me that last year when she was pregnant with her third that the guy next to her went to the restroom more often then she did. But we had fun. Also, we saw a lot of babies there. 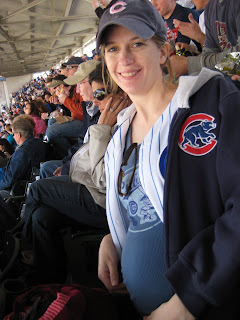 Here is the cubs belly picture. 32 weeks.